The Nazi German invasion of Poland in September 1939 is normally regarded as the official start of World War Two. Hailed as a prime example of a successful blitzkrieg, the Nazi’s rapid victory hid a myriad of failings in their doctrine beneath its successes. The light (Panzer) divisions were a failure in practice that was hastily rectified for the 1940 campaign in the West. 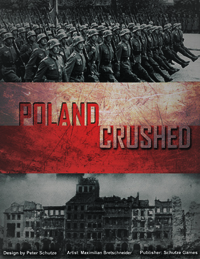 The dire straights 4th Panzer division found itself in on the outskirts of Warsaw resulted in more infantry support for the panzer components and highlighted the risks of armored units in urban combat. While the French and British failed to vigorously pursue opportunities during the period and paid a heavy price in coming years, it was the Soviets who would pay most dearly for their folly in supporting Nazi Germany with millions of casualties when their turn came almost two years later. Paul Kwon 9 9 9 Neat game. Wish map was a bit larger, since it is not congruent with the size of counters.